FOR TEN years, Michael Cohen was Donald Trump’s attack dog. By his own estimate, the president’s former fixer threatened more than 500 people or entities at Mr Trump’s request. But in sworn testimony before the House Oversight Committee on February 27th, and armed with documents to bolster several striking accusations, Mr Cohen called his former boss “a racist…a con man [and] a cheat” who is “fundamentally disloyal” and a threat to American democracy. The parties’ responses to his testimony hinted at how they will respond to Robert Mueller’s imminently expected report, providing a preview of the political battles likely to rage for the rest of Mr Trump’s term. None of Mr Cohen’s accusations were entirely new. But hearing them made openly before Congress, under penalty of perjury, crystallised how extraordinary they are. Mr Cohen said that Mr Trump knew in advance—courtesy of Roger Stone, a political consultant who had been urging Mr Trump to seek the presidency for decades—that WikiLeaks would release stolen emails damaging to Hillary Clinton’s campaign. That may have violated federal campaign-finance law, which bars Americans from accepting any “thing of value” from foreign nationals. More importantly, it would make the campaign complicit in an attack by a foreign intelligence service. Mr Cohen also entered into evidence a pair of cheques—one signed by Mr Trump from his personal account and the other from his trust account, each for $35,000, both from 2017, after he took office—which he said were reimbursements for hush money paid to a pornographic-film actress. Mr Cohen says that as late as February 2018, Mr Trump told Mr Cohen to say that he did not know about these payments. He also brought three financial-disclosure statements to illustrate his claim that Mr Trump inflated his net worth when he wanted people to think he was rich, and deflated it to minimise his taxes. In 2012-13, according to the statements, his net worth rose from $4.6bn to $8.7bn—due largely to his “brand value”, which Mr Trump did not mention in 2012 but by 2013 was somehow worth $4bn. Questioned by Alexandria Ocasio-Cortez, who showed that she was almost as effective an interrogator as she is a tweeter, Mr Cohen said that Mr Trump also inflated the value of his assets to an insurance firm, which would count as fraud. Mr Cohen said Mr Trump, “knew of and directed the Trump Moscow negotiations throughout the campaign and lied about it.” He said he briefed Mr Trump, as well as Donald junior and Ivanka, about the project around ten times in 2016. Mr Cohen said he knew of no “direct evidence that Mr Trump or his campaign colluded with Russia.” But, he said, “I have my suspicions,” noting that Mr Trump’s desire to win at all costs made it conceivable that he would collude with a foreign power. Republicans on the committee did not really defend the president from these accusations. Instead, they implied that Mr Cohen’s testimony was some sort of plot to land a lucrative book or film contract. And they impugned his character, noting that he was convicted of lying to Congress, among other things, and will soon begin a three-year prison sentence. But literary glory aside, it is unclear what Mr Cohen’s motivation to lie to Congress again would be—particularly as Mr Mueller’s office was certainly watching, and would doubtless have charged him again had he done so. Mr Trump can take comfort in the Justice Department policy, which warns against indicting a sitting president. And campaign-finance convictions are hard to win. In 2012 federal prosecutors failed to convict John Edwards, a Democratic politician, for spending donor funds on hush-money payments to a mistress. 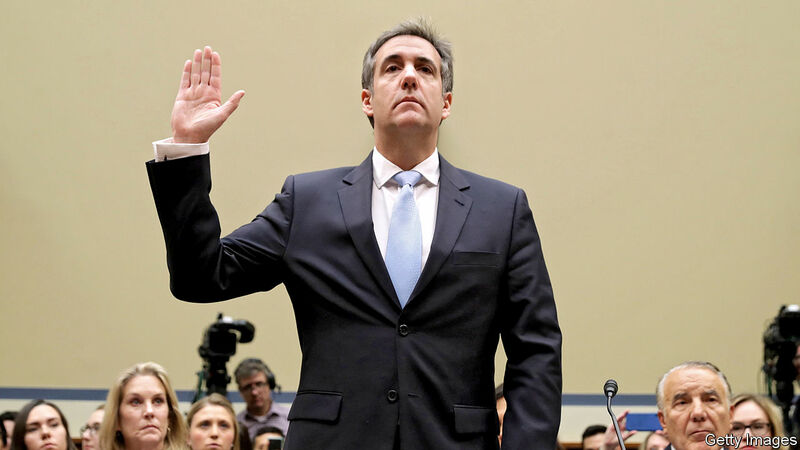 Still, Mr Cohen accused the president of conduct more serious than that which led to impeachment for Bill Clinton (lying about an extramarital affair), and which is comparable to Richard Nixon’s (covering-up a break-in at Democratic headquarters). For Mr Trump, that ending remains a long way off. While he has solid Republican support, Democrats will shy away from impeachment. But the prospect is closer now than it was before Mr Cohen testified.